You can’t hold yourself hostage for the love and the awareness that you didn’t have at the time of the incident. You must evaluate yourself based on the experiences that you’ve had up until this point instead of based on who you were when the original incident occurred. Holding on to the guilt, the shame and the unworthiness that you’re holding within you, is not serving you and it’s not serving the other individual involved either. You must cultivate the courage to let yourself off the hook. 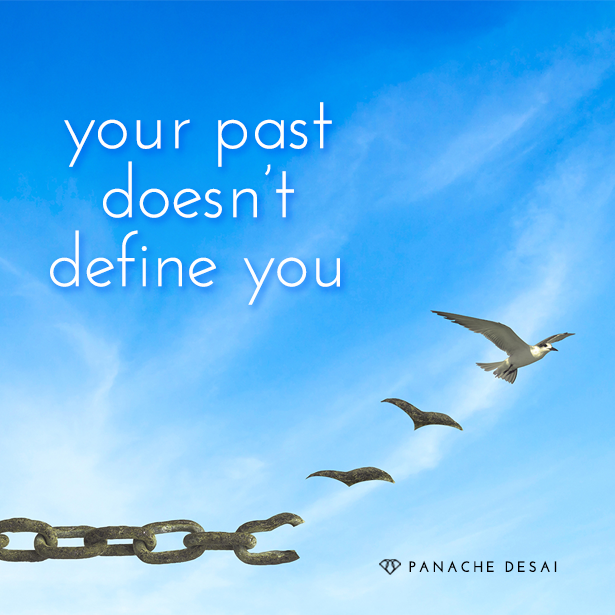 How do you let go of the guilt and forgive yourself? You must lovingly cultivate an inclusive relationship with the part of you that you believe was responsible for the wounding of another. Begin to give that aspect of you a hug and cultivate a loving relationship with the part of you that was once rooted in fear. You have only ever done the best that you can. Hi Sweet Friend its Panache! I know that many of you believe in your heart that you have done things that are unforgivable. Either you actually did something to somebody else that hurt them or you stood by and allowed something to occur that you have deemed to be unforgivable. Just take a deep breath. What I’m about to say is going to stretch you and it’s going to expand you. I want you to know that you can’t hold yourself hostage for the love and the awareness that you didn’t have. Many of you when you look back on yourselves through the lens of your awareness based on where you are now—you can begin to see yourself as wanting or missing. You evaluate yourself based on the experiences that you’ve had up until this point instead of based on who you were at that point when that original incident occurred. Quite honestly everything that has occurred that you have taken personal responsibility for, for the most part has happened unconsciously. I know this because I know who you are. None of you that are here would consciously ever do anything to hurt another human being. It flies in the face of your purpose. It flies in the face of who you are as a human being and yet unconscious choices based in fear still happen. Unconscious choices to stay or to abide in a state of powerlessness in the midst of trauma and abuse, as its unfolding, still occur. So what I want to do in our time together is provide you a safe place to land. To simply let you know that that which you believe you have done that damaged another person, actually in some way has served as an evolutionary catalyst for them. Even though you’ve personalized it and made it about you and are riddled with guilt and shame around the decisions and choices that you made at that point…. I want you to know that holding on to the guilt and the shame and the unworthiness that you are currently holding within you is not serving you and it’s not serving that individual. In time, all things are revealed and through the lens of limited human perception we can’t begin to see the greater plan as to why things happen in the way that they do. It is for that reason that we must turn to feeling what there is to feel within us. It is for that reason that we must cultivate the courage to let ourselves off the hook and that doesn’t mean that we’re giving ourselves permission to consciously repeat and recycle unconscious patterns over and over and over again. I’m not giving you a “trash everybody in your life” hall pass. That’s not what I’m advocating, but what I’m advocating is for you to lovingly cultivate an inclusive relationship with the part of you that you believe was responsible for the wounding of another. I’m advocating that you begin to give that aspect of you a hug and that you cultivate a loving relationship with the part of you that was once rooted in fear. And so, here’s what I want you to do… I want you to close your eyes and open your palms and I want you right now to begin to feel the loving support of this energy and this presence that is God, that is the Divine, that is love. I want you to allow this presence to just envelope you, to provide you the safety and the comfort and the nurturing, to really explore that which you have hidden away, that which you are ashamed of, that which is now be relegated to the ranks of your shadow, that which you will not allow to see the light of day – actions or behaviors that may well be the root cause of any addictive patterns or behaviors that you have right now. Everything that you have in some way may mean that you are less of a person and that you are less available to love and be loved in return. Everything that you have made may mean that you are not a loving, compassionate, empathic, caring human being. I’d like you to just see yourself at the age where that original incident occurred. For some of you, it may be in a marriage, newly married, abusive, explosive partner and you’re just frightened for your life and there’s an inability on your part for you to intervene or say or do anything. You just freeze in the presence of that rage. For others of you, it may be at work where a work colleague was being shamed and bullied consistently and you knew that it wasn’t right and you didn’t speak up because you were afraid of being ostracized or in some way losing your position. For others of you, it may be not intervening when you knew that somebody was making a bad choice or a decision that later led to them taking their own life in some way because the pain inside of them was so unmanageable. Just see yourself at the age when that original transgression occurred, where either you were perceiving yourself as the perpetrator or the enabler. Either way, just see yourself in your mind’s eye at that age. And what I would like you to do, my beloved sweet friends, is just simply see yourself as you are, giving you, at that age, a hug. I would love for you to embrace yourself right now completely without judgment in the same way that a mother embraces her child over and over again, regardless of what that child does. In the same way, the Divine is only ever embracing you in that same way. I want you, right now, to give yourself a hug with profound acceptance, with profound love and most importantly of all with compassion and empathy for yourself. For yourself, recognizing; and I’m not just saying this as a throwaway, I mean it as a statement of fact that you have only ever done the best that you can. So the best that you could do in that moment was freeze in the fear. The best that you could do in that moment was hurt another person. The best that you could do in that moment was lash out. The best that you could do in that moment was engage in your reality through your survival functioning or through your survival mechanism—your fight or flight or freeze mechanism. But that is just a part of you, that isn’t the totality of who you are. So as you’re embracing yourself, at whatever age this original incident occurred, I’m just going to lovingly support that part of you in once again being fully enveloped in the light, being fully embraced by the light, in coming home to the divinity that it is and the light being revealed in the midst of this situation and scenario. I want to support you right now in this moment in being freed of this burden that you’ve been carrying around or you feel responsible for what you did or for what you didn’t do. Either way, the identification with what occurred is the cause of suffering. I’m going to lovingly ask that as you embrace this aspect of you, that the suffering associated with this incident just dissolve, recognizing again that you are a loving, kind, empathic, compassionate soul and that you would never do anything to hurt another person on purpose. I know this about you. I know that you are innately love. I know that you are innately kindness. I know that you are a blessing upon this earth. Just continue to breathe, relax and receive, and I invite you beyond this one particular example to do this for every aspect of you that you believe in some way played the role of transgressor or played the role of enabler. I’d like you to lovingly go through every incident where you acted in a way that you believe hurt somebody or you acted in a way that allowed somebody to be hurt and I’d like you to gather up all of those parts of you that you perceive to be broken, because I want you to know that it is in through your embracing all of these parts, that you come back to wholeness, you come back to oneness and most importantly of all, you come back to love. I want you to know that there is nothing that you could ever do, that would stop the Divine from loving you. I want you to know that you are held in the highest, always, and that my sweet friends, you are returning to love.